Approxametely 15 miles west of Leland, the Manitou Islands rise from Lake Michigan. This archipelago is a vital part of Sleeping Bear National Lakeshore, yet very few visitors ever get there. 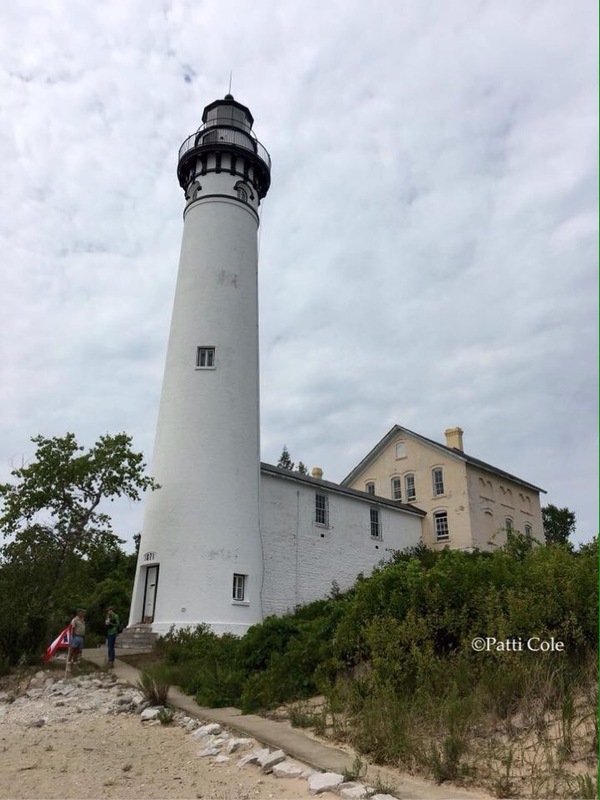 A few weeks ago, Diana discovered a trip that the Leland Historical Society was taking to both North and South Manitou Islands on the same day. Ferry riders normally get to choose between one or the other, and the transit schedule North Manitou requires overnight tent camping. This once-a-year trip offered both islands! Seeing that we had never been to either one, we decided to join the tour. Joining us would be our friends Camilla, Lane and Patti. The trip was supposed to take place on Tuesday, August 23, but it was delayed two days because of strong southwesterly winds. As luck would have it, that put the trip on Thursday, August 25th…the 100th birthday of the National Park Service! We arrived at Fishtown in the village of Leland, ready for adventure! 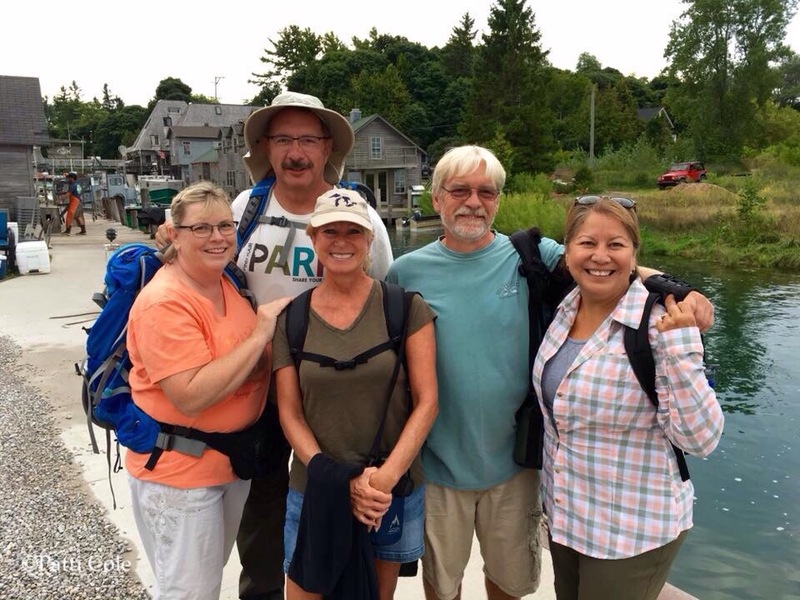 For those who have never been to Leland, Fishtown is the historic dock where Lake Leelanau empties into Lake Michigan. Some of the old fish processing shanties have been turned into a collection of gift shops, while others still house fisheries. Our vessel for this special trip was the 52 foot Manitou Isle. Built in 1946, she has seen a lot of use in her 70 years. The larger and newer ferry on the left is the one that is used daily. As we approached our first stop, the South Manitou Light Station came into view. After years of visiting this region, we’ve finally made it to South Manitou Island! The smaller of the two isles, South Manitou is 8.2 square miles. There is a ranger station that houses a few seasonal workers, but no permanent residents. That’s not to say it was always that way though. The island has been home to lumbermen, farmers, lighthouse keepers, and lifesaving crews. 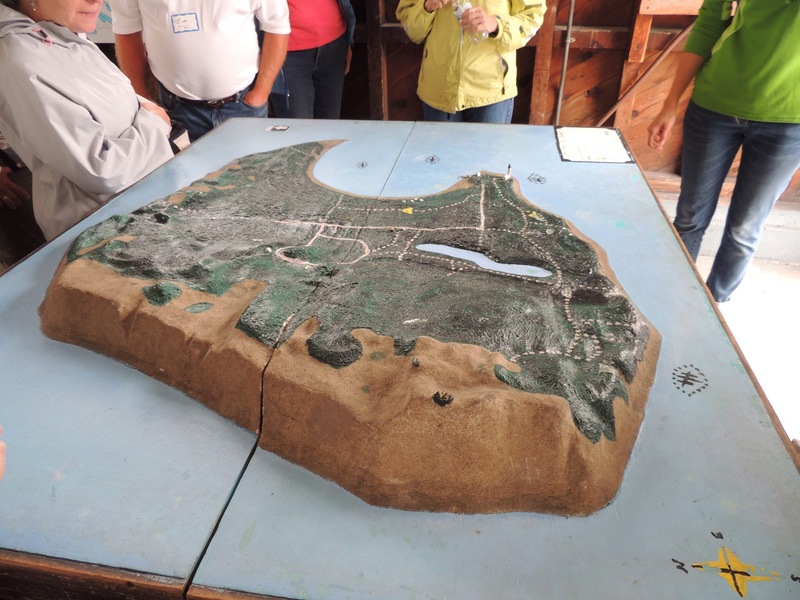 This relief model of the island shows how the western side is dominated by dunes. Both North and South share this feature, as do the Fox islands to the north, as well as most of the shoreline of the mainland in Leelanau County. The model also shows the crescent-shaped harbor, which is the only natural deep water harbor between Buffalo, NY and Chicago. The football-shapes in the water are shipwrecks. The one on the right is the latest shipwreck, the Francisco Morazan…a 234 foot steamer which ran aground in a November gale in 1960. Most of the vessel is still visible above the waterline. Time constraints did not allow us to visit the wreck or the giant 500 year old cedar trees that stand west of it. If you recall in my previous post, Port Oneida Fair, I spoke of a ship owner named Thomas Kelderhouse. On this day, we were honored to have our tour guide be his great-great-great granddaughter, Kim Kelderhouse! 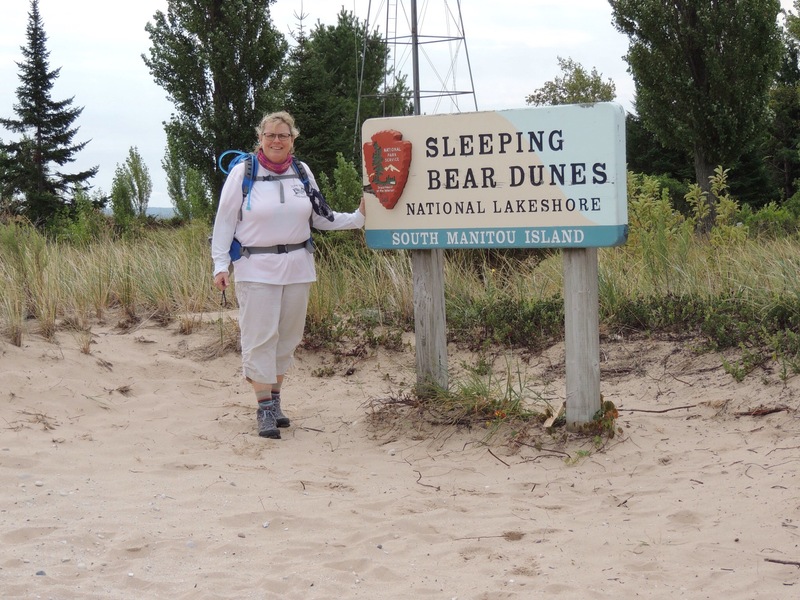 Here she is explaining the legend of the Sleeping Bear, which is how the dunes and the national lakeshore received their names. According to Native American folklore, a mother bear and her two cubs were driven into Lake Michigan by a great forest fire in Wisconsin. Knowing their only escape was to get to the other side, they swam day and night. The cubs lagged behind and drowned just off the Michigan shore, where their mother waited for them. The Great Spirit eventually covered the cubs with sand, creating the Manitou Islands. 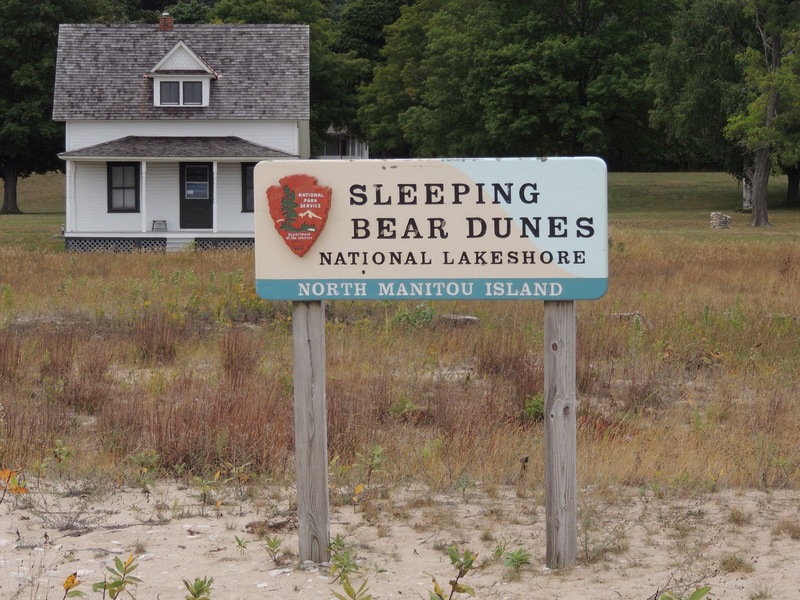 As the mother bear slept, he also blanketed her, creating the Sleeping Bear dunes. As Kim stated, it is indeed a sad tale. After leaving the dock area, which is where the former lifesaving station stands, we split up into two groups. One group headed to the farm and cemetery, and our group headed with Kim to the lighthouse. 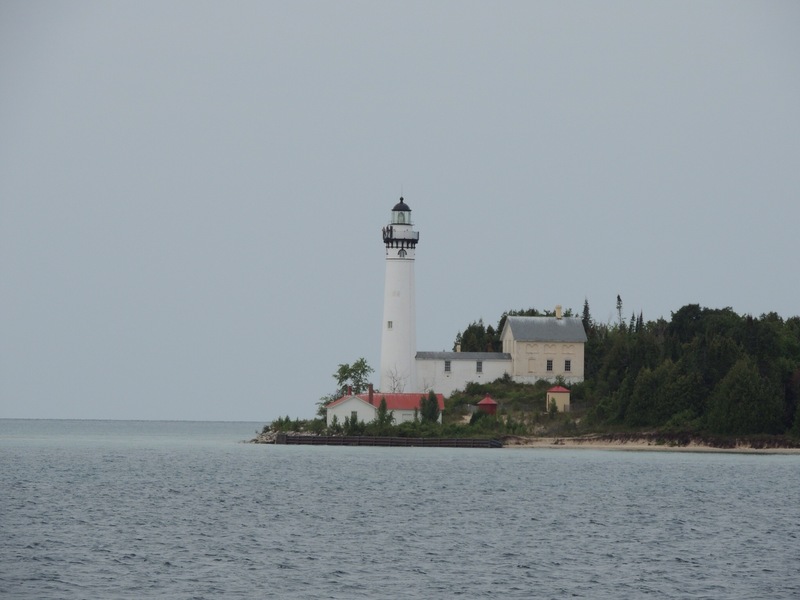 South Manitou Light Station was first established in 1840. The original tower was replaced in 1858 by the cream brick structure in the photo above, which had a lantern room on top. 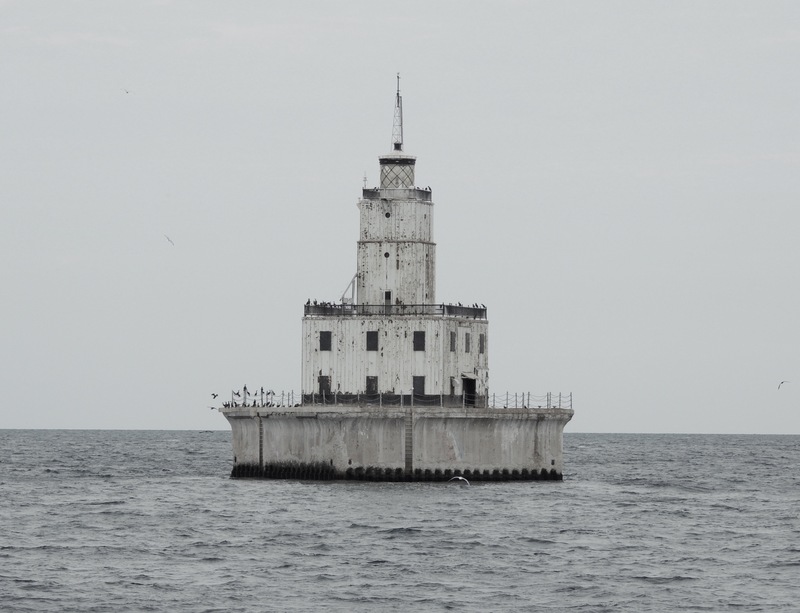 It was deemed that light was too short (64 feet), so the current tower was built in 1872, closer to the water. It has a focal plane of 104 feet above the lake surface. 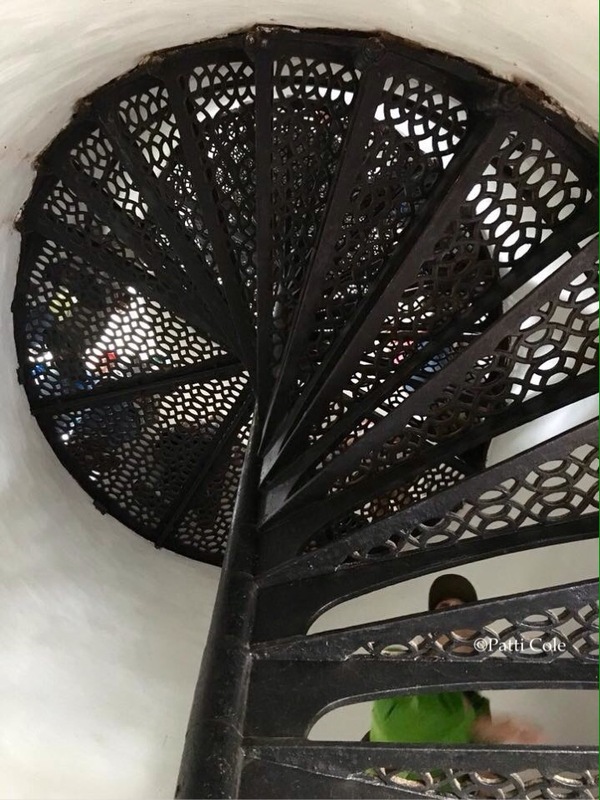 Kim explained how the spiral staircase is only supported in the center. If it were attached to the sides, the tower would crumble as it shifted in the wind and the stairs pulled at the walls. I’ve been to many lighthouses over the years and never knew that fact. Learn something new every day! 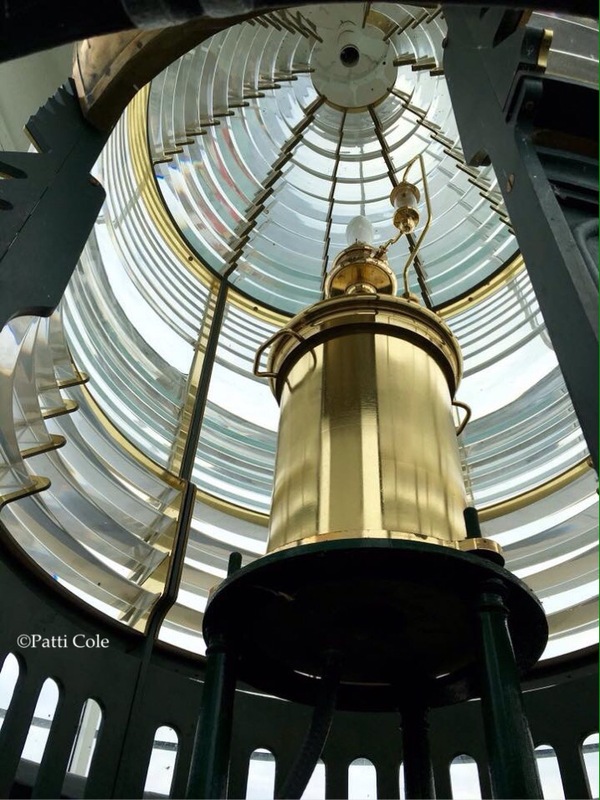 The third order Fresnel lens is a replica. The light shines nightly from May through October. Here’s the motley crew on the lighthouse gallery! 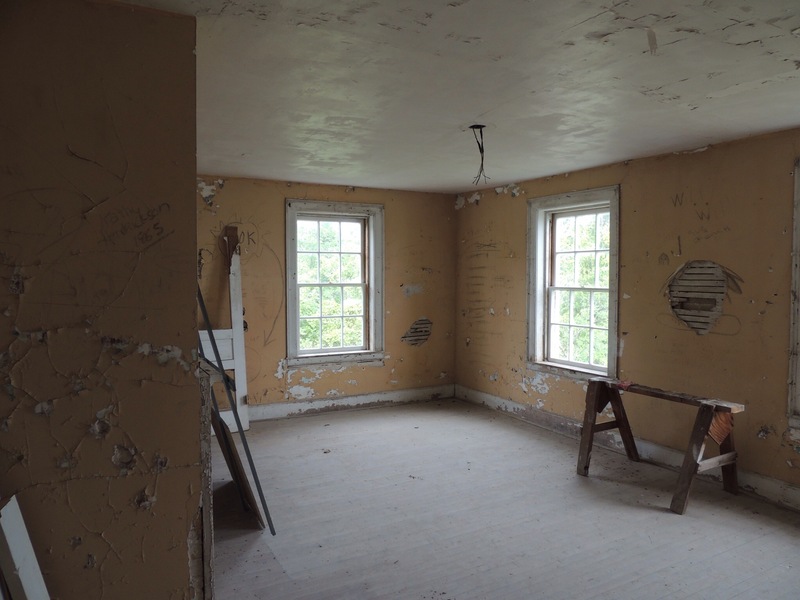 Kim took us into the keeper’s quarters, which is awaiting restoration. The windows were recently replaced, thereby stabilizing the building. 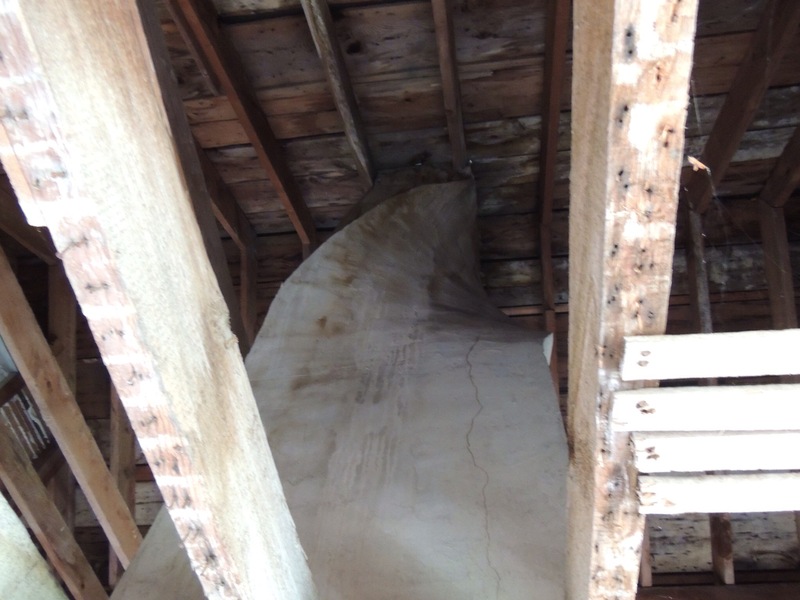 The lack of a ceiling upstairs allowed us to see this interesting twist in the chimney, which made it possible to exit the roof without disrupting the rafters. 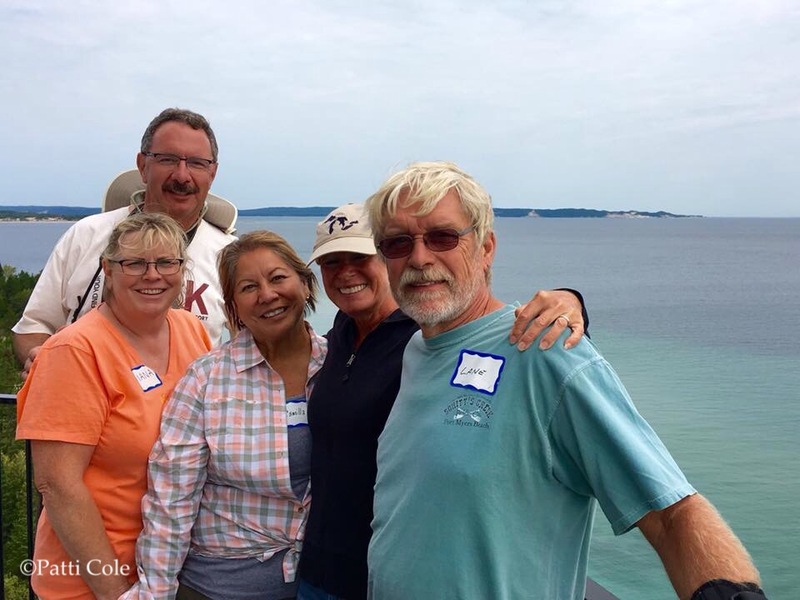 From the lighthouse, we headed back to the boat and headed off to North Manitou Island. As was the case at our previous stop, North Manitou Island’s dock is near the lifesaving station. 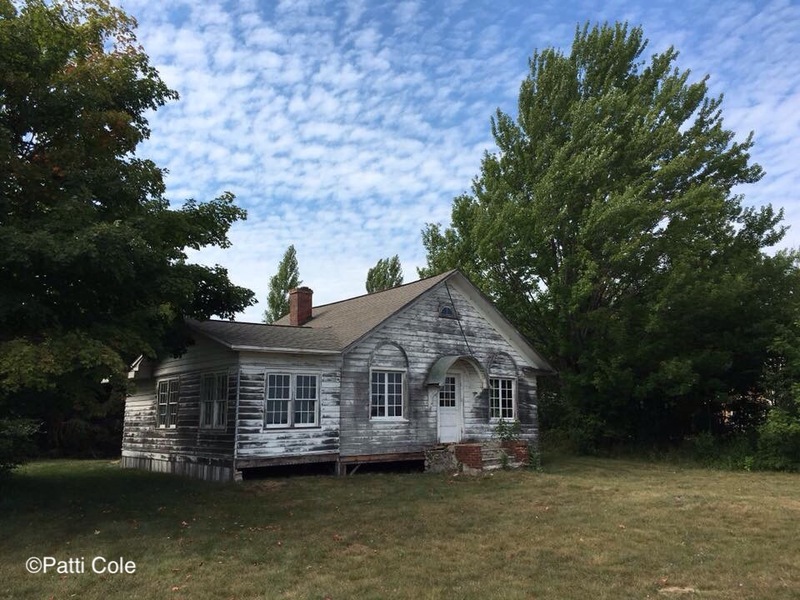 The unique thing about this location is that it is the only remaining station to have buildings that were used from the beginning of the Lifesaving Service through the Coast Guard. 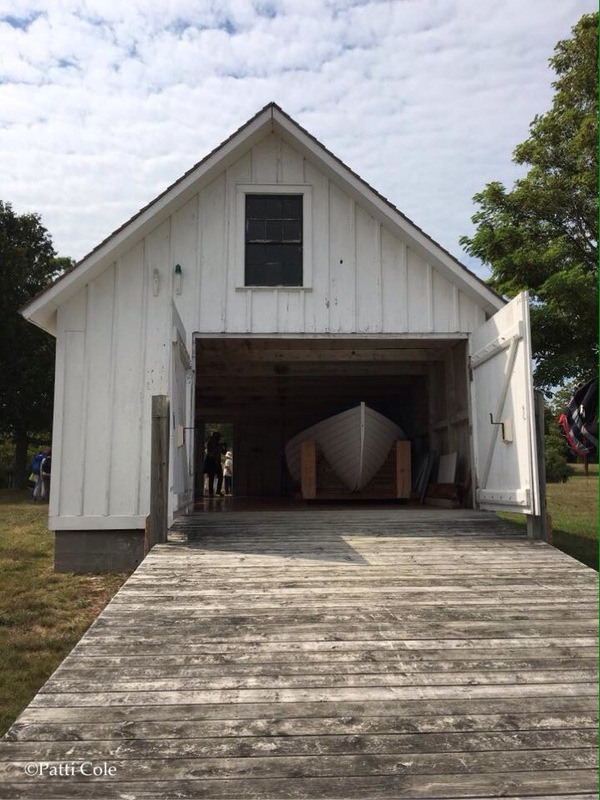 This boathouse is the only remaining example that used the original 1854 standardized plans, and it was built that same year. 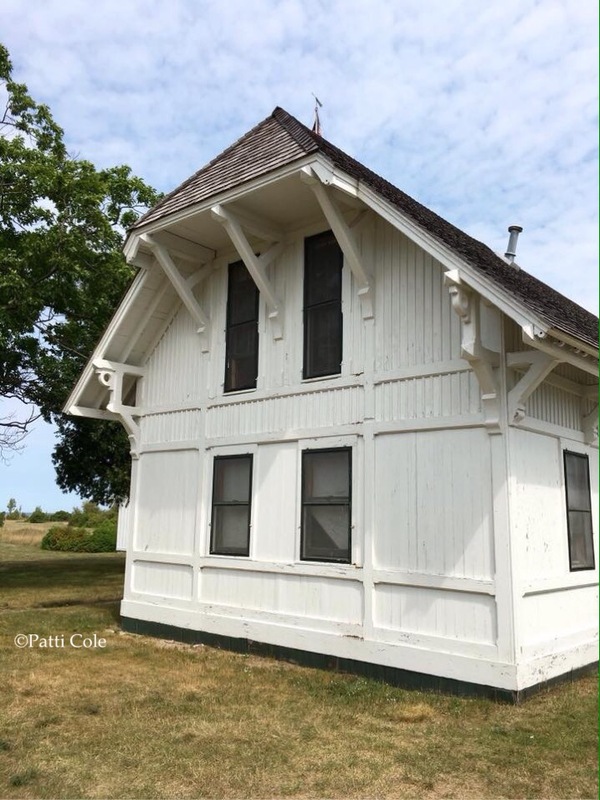 The 1877 Lifesaving Station was a combination crew quarters and boathouse. 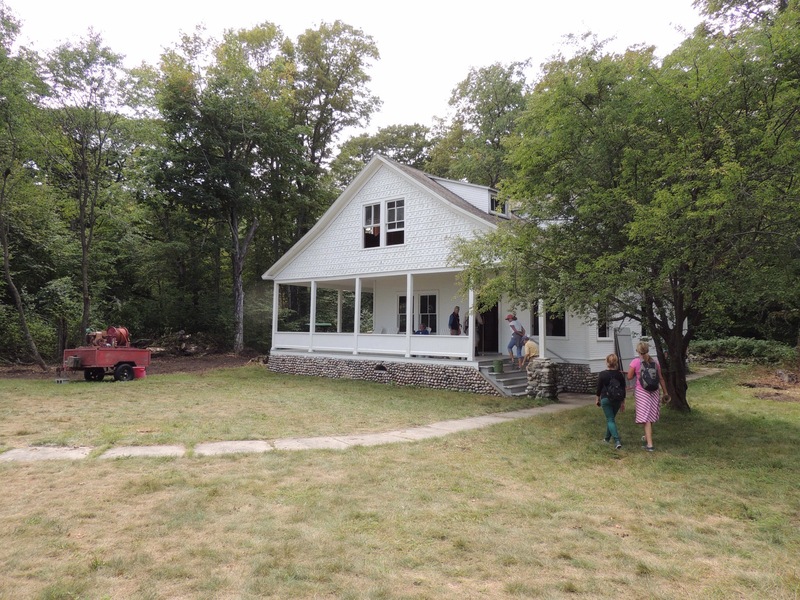 It was later converted to quarters and a storehouse by the Manitou Island Association, and then to a dormitory by the National Park Service. As was the case on South Manitou, North started out in the lumbering business selling cordwood to passing steamers. 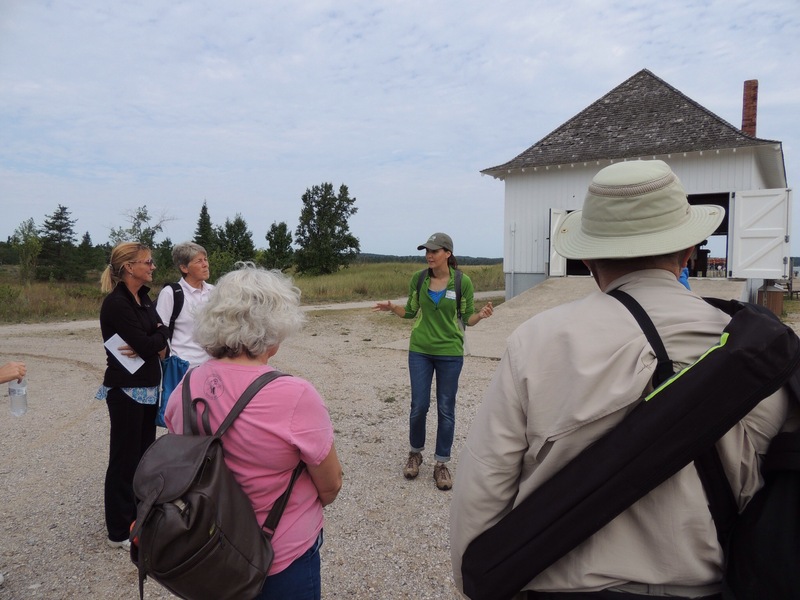 When the trees were exhausted, the Manitou Island Association formed, which farmed the land. A large barn from the farming era still exists to the north of the village near the dock. 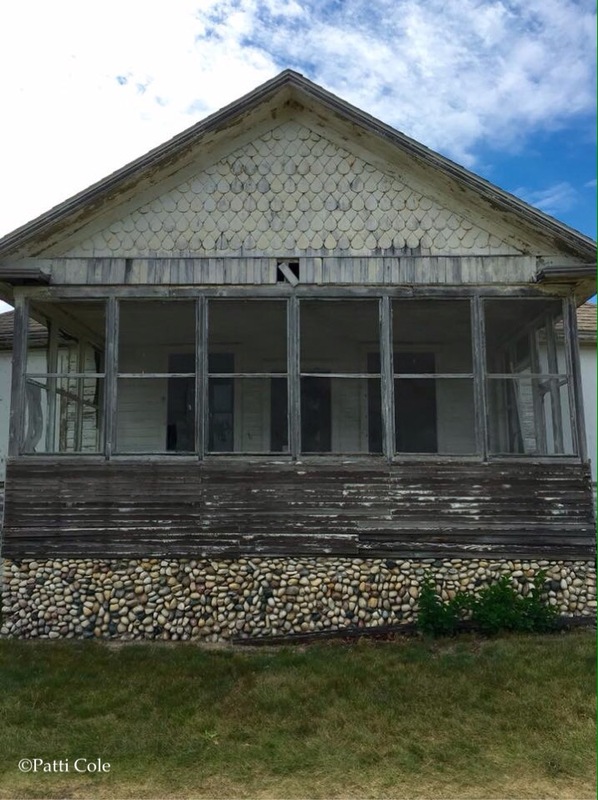 A unique feature on North Manitou is Cottage Row. There are 10 parcels that were owned by successful Chicago business owners who vacationed here in the summer months. The cottages on these lots were built between 1893 and 1924. This cottage, the Monte Carlo, was designed by a 26 year old Frank Lloyd Wright when he was employed at the Sullivan firm in Chicago. It was built in 1894. Also built that year was the Trude-Fiske cottage. It remained in the family until 1979. The Wing Cottage was also built in 1894 and was owned by several families over the years. Note the fieldstone foundation. The Riggs-Londergan Cottage was built in 1924. 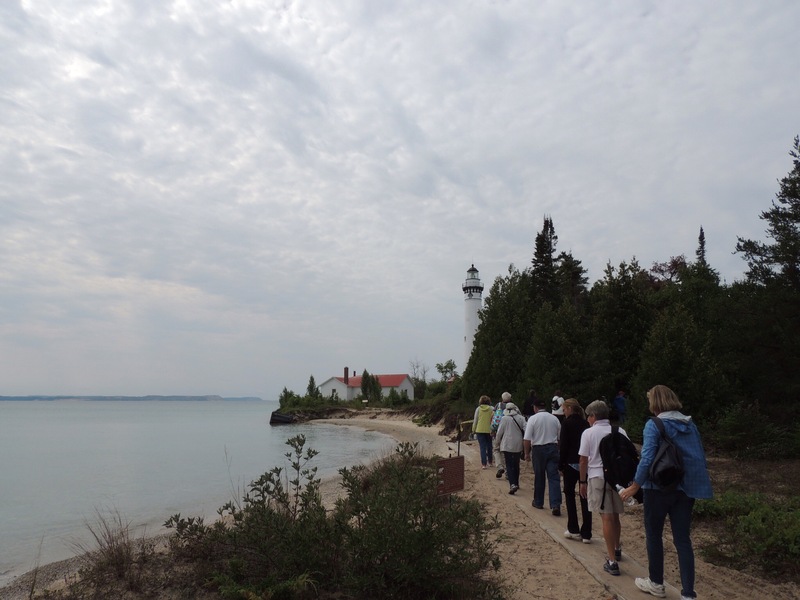 The Manitou Island Association purchased it in 1958. 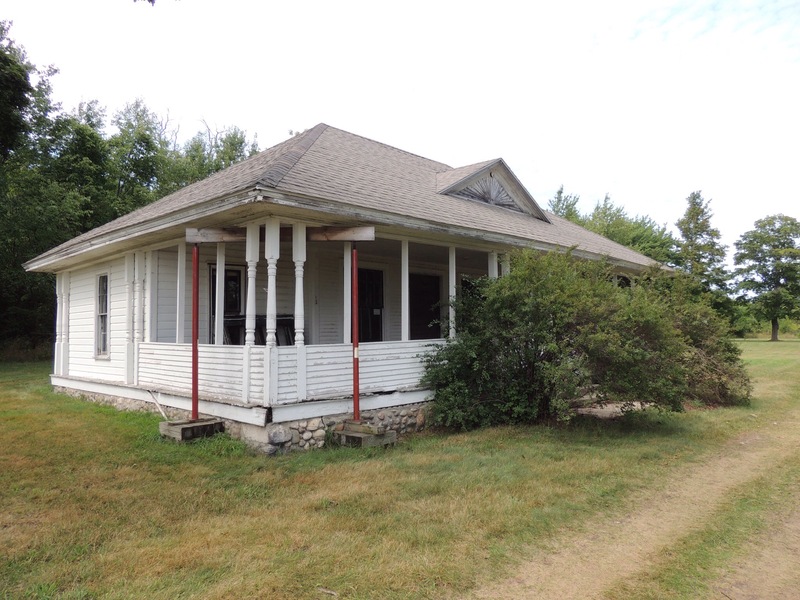 This is the Katie Shepard Hotel, which is currently being restored by Preserve Historic Sleeping Bear volunteers. It was built in 1895. Although plans aren’t firm, the thought is that visitors will be able to use it as an alternative to tent camping, similar to a hostel. 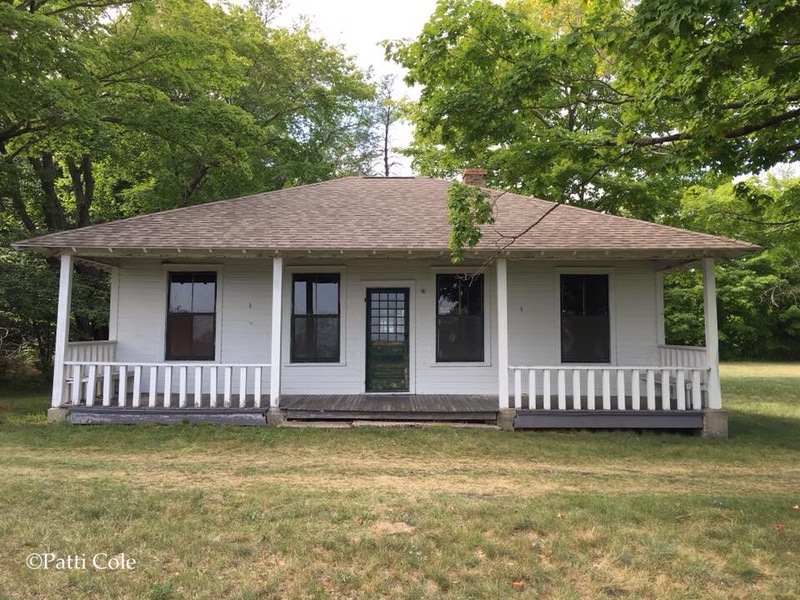 There are a few other cottages, including one that was ordered out of the Sears catalogue. 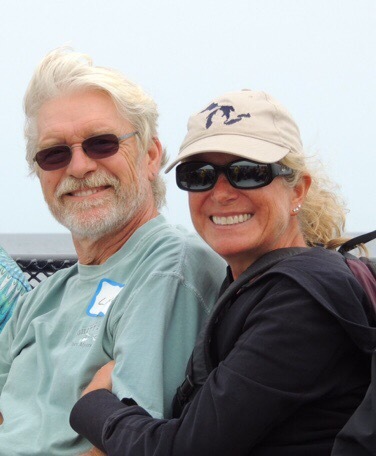 Diana found it interesting that, of all the places these wealthy city dwellers could have chosen to spend their summers, they decided on an island in northern Lake Michigan without electricity or running water. 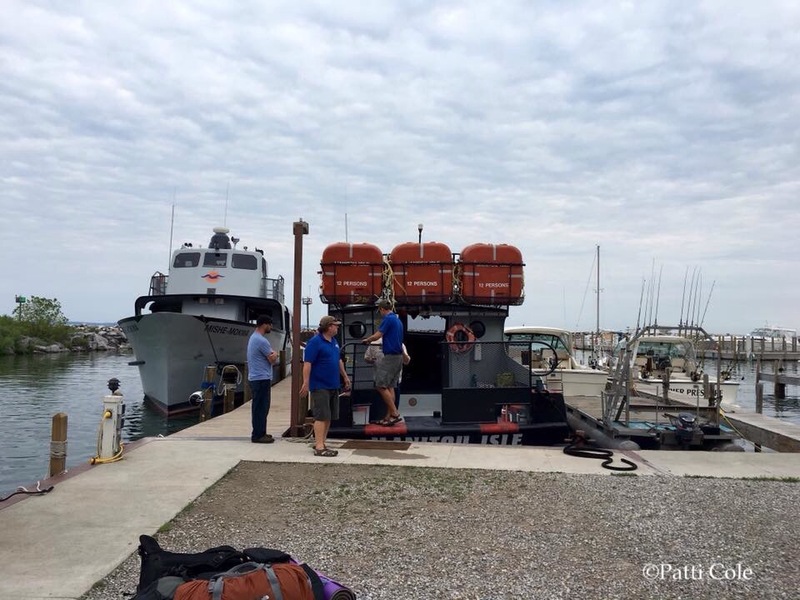 From North Manitou, we headed back to the mainland to the dock at Fishtown. 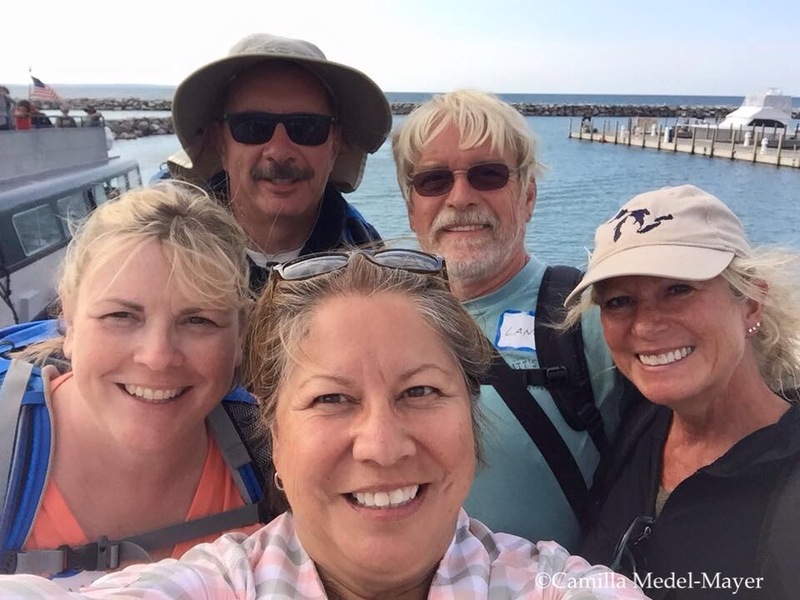 Camilla took one of her famous selfies to document our safe return! What a great day with friends! Search and shop exploRVistas Amazon link here!